How do I search for candidates in 6.0? In ENGAGE's 6.0 release, we have combined the talent discovery and traditional candidate search modules into one seamless candidate search function! All candidate searching will now be conducted from the "Talent Discovery" module. Talent Discovery now provides the same advanced filters as in the traditional candidate search function including Boolean searching capabilities. 1. Begin a search by using the filters on one of the first two pages of search fields - then you will be able to apply others to narrow down your search. 2. Use the interactive talent map and apply as many other filters as you'd like to narrow down your search results. 3. 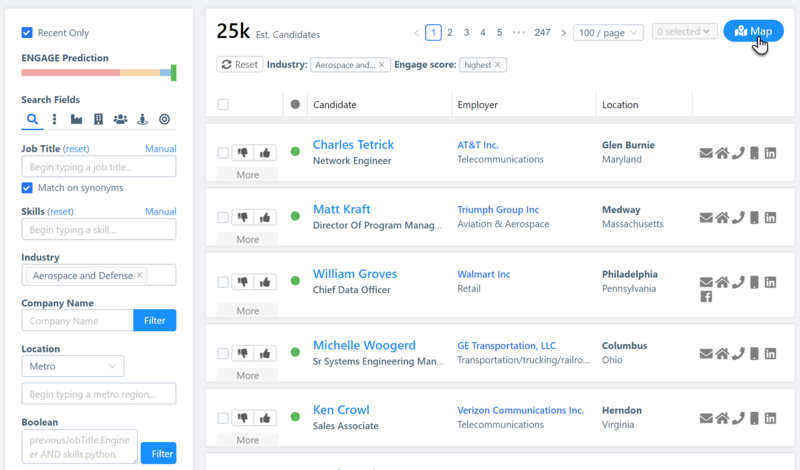 Once you have a good candidate pool and are ready to start vetting through candidate profiles, look to the "List" button on the top right-hand side of the talent discovery screen. 4. The "List" button will take you to the candidate profiles where you can begin vetting profiles and creating lists. You may save these searches as "Projects" by selecting the + button on the top left hand corner of the Talent Discovery module. To load a saved project, simply use the "Load a Project" option in the top left hand corner and all of the filters will populate with the search criteria.